After a morning of trying on wedding dresses, it's perfectly natural to think, "Hmm, I really need a burger, fries and a shake," right? 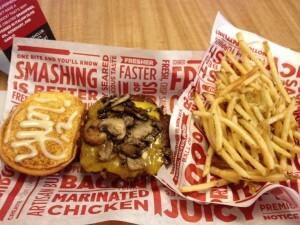 Denver-based chain Smashburger is the latest entry in to the better "fast-food" burger race. It opened in December across from the Natick Mall. It's aiming to compete with places like B.Good and Shake Shack. Smashburger advertises that they use fresh, never-frozen 100% Certified Angus beef and have hand-spun shakes. I got the truffle mushroom and Swiss burger (truffle mayo, sautéed crimini mushrooms and aged Swiss on an egg bun, $6.39). I shared a side of Smashfries (tossed in olive oil, rosemary and garlic, $2.29) and a salted caramel shake ($4.59) with Christine, one of my intrepid bridesmaids, who came up for a weekend of dress shopping and cake tasting. They will only serve the burger medium or above, but I still really enjoyed my burger. It was flavorful and juicy (and how cute is it that they wrote "yum" in mayo on the bun??). The fries were thin, crispy and golden. I liked the addition of the rosemary and garlic. I loved that the shake was served with a metal canister. I think that Shake Shack wins in the head to head comparison, but there wasn't a 35 minute line for Smashburger, so it wins for convenience.